With limitless opportunities at his disposal after the success of "Gravity," Cuaron decided to go home. And the result — a neorealist blend of intensely personal filmmaking and overwhelming visual command — has been hailed as a masterpiece. "There were huge and beautiful offers after 'Gravity,' and very tempting. And offers from a financial standpoint that were really appetizing," Cuaron said in an interview. "But it was one of these things that I needed to do out of the deepest admiration for cinema that has to do with personal journeys." 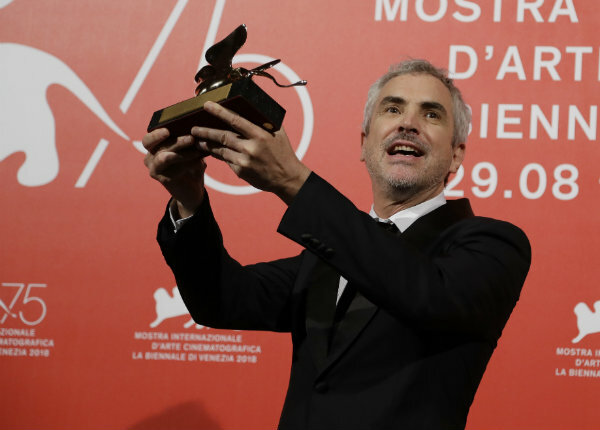 Days after "Roma" took the Golden Lion at the Venice Film Festival, Cuaron and the film arrived at the Toronto International Film Festival where the rapturous responses to his soul-searching continued unabated. "Roma," which will have a limited theatrical release on Netflix this December, is Cuaron's first Spanish-language film since his 2001 breakthrough, "Y Tu Mama Tambien." But for Cuaron, "Roma" is more than that. It's a new beginning. "It's something that's been brewing for a long, long, long time. I first started taking it seriously in 2006. It's the film I was meant to do. It's my first film. It's the film in the sense that I made absolutely fearlessly. I threw away everything that I have learned to do this film," said Cuaron. "Well, not everything because I wouldn't have been able to do this before now." "Roma" is about domestic worker Cleo (Yalitza Aparicio, speaking in her native Mixtec), who devotedly works for a family that lives in the Mexico City neighborhood of Roma. Their home life, while pristine, is cracking (the father leaves his wife). And the tumult of early '70s Mexico, when student protests clashed violently with the police, is all around. Society is fraying, and it's the women who bear much of the brunt of it. "It's an observation of a character journey as much as it's an observation of a country, and a country that, like the United States and much of the world, has this perverse relationship between social class and race," said Cuaron. The production was unique. In the lengthy 108-day shoot, no crew member or actor had a screenplay. The only one beside Cuaron who did have a script was executive producer David Linde of Participant Media, who noted at the film's Toronto premiere: "And I don't speak Spanish." Unlike most films, Cuaron also shot in absolute continuity. "I didn't want the actors or even the crew to have preconceptions or defined answers," said Cuaron. "It was a process for everyone to be constantly searching. I was just honoring moments — the sense of time and space in those moments, but also honoring the emotional elements of those moments." Cuaron estimates that 90 percent of the film comes from his own memories and old photographs. He reproduced his family's home, cast actors who looked as close as possible to his family members and obsessed over recreating the details of his early life. Cuaron served as his own cinematographer after his usual director of photography, Emmanuel "Chivo" Lubezki, had to pull out due to other commitments. "I reproduced every inch of my childhood home with 70 percent of the original furniture," Cuaron said. "We reproduced every single tile that existed in that house. We shot on the street of my childhood home. We shot in most of the places where those scenes took place." And though "Roma" is of a far smaller scale and more intimate than his "Gravity" or "Children of Men," the 56-year-old filmmaker used many of the techniques he's mastered from more spectacle-driven movies. He shot it digitally in 65mm and used Dolby Atmos for the lush sound design. In the film's climactic moment, the sounds of the churning surf on a beach envelop the audience. On the stage of the Princess of Wales Theatre in Toronto, Cuaron explained the journey of "Roma" to the crowd: "I really wanted to come to terms with the elements that forged me." Review: Director Alfonso Cuaron's "Roma"